Product code: P992 Categories: Sold Items, Sold Rings. This is a very elegant and attractive antique sapphire and diamond ring dating from the 1880’s Victorian era that looks so good on the finger and really stands out. Thanks to the elegant lozenge shape of this ring, it tapers at each end to a wonderful point and really accentuates the finger. 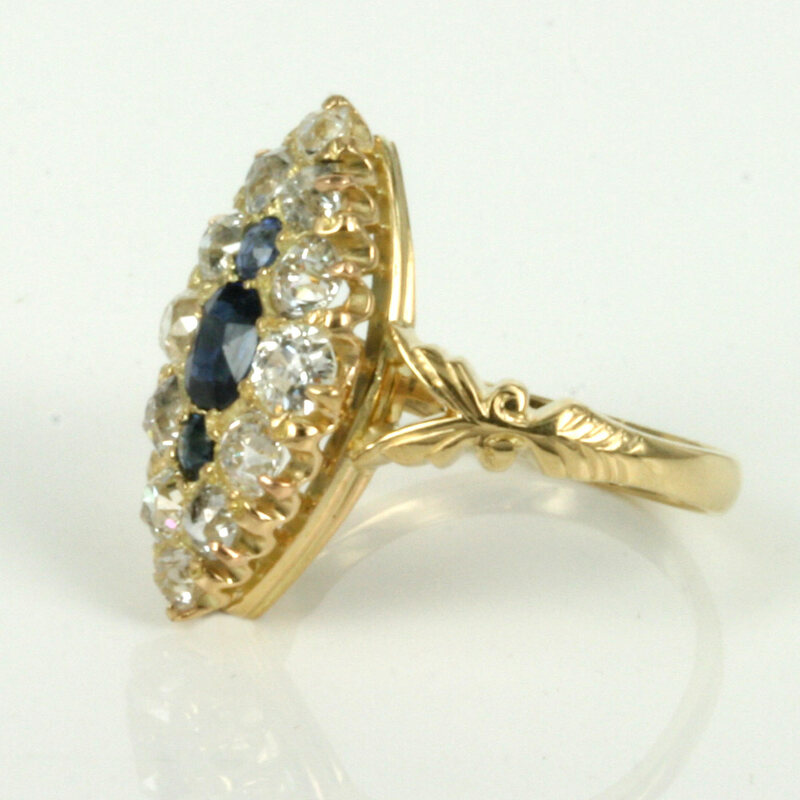 Hand made in 18ct yellow gold, this ring dates from the 1880’s, and would make a ring perfect for any occasion as well as a standout example of an antique sapphire and diamond engagement ring. Measuring 20mm from end to end by 10.5mm wide and is set with 12 very vibrant antique European cut diamonds that totals 1.42 carats and they are all surrounding those fabulous 3 blue sapphires that are the most fantastic royal blue in colour. 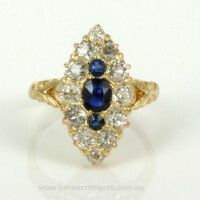 These sapphires total 0.62 carats and are all matched perfectly in colour and make a wonderful statement on the finger. The length of this ring is in perfect proportion to its width and is such an easy to wear ring all the time. Antique sapphire and diamond rings are always popular as engagement rings or simply for any occasion that arises and lozenge rings always look so good on the finger and this is one antique sapphire ring that will always be admired day or night.